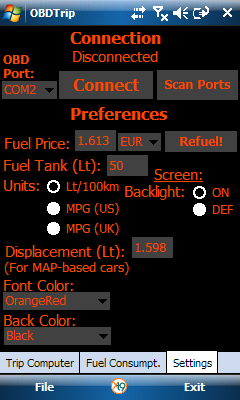 OBDTrip is a Windows mobile trip computer application! 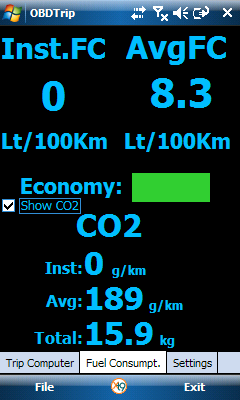 It connects to your vehicle's computer, monitors data and calculates fuel economy, CO2 emissions and useful trip data. OBDTrip uses the On-Board Diagnostics (OBD II) data communication type which is common for all the vehicles manufactured after year 2000 in most of the countries. Some vehicle manufacturers have implemented the OBD II protocol even before 2000, for example some Fords are equipped with it from 1996. This type of communication has various different protocols, however OBDTrip is able to communicate with all of them. For the communication with the car's ECU, OBDTrip requires a Bluetooth or serial port OBD II scanner. If you do not have a tool like that, please look at the links on the right of the page where you can find such tools on the internet either in e-shops or through e-bay. NOT FREE! SHOULD BE REMOVED FROM FREEWARE SITE!